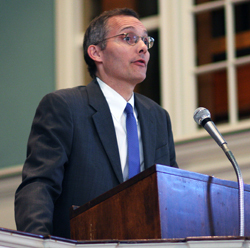 Professor of Political Science and private attorney Scott Himsel ’85 delivered Thursday’s Chapel Talk focusing on a recent U.S. Supreme Court ruling that can teach a lesson to all Wabash men. His talk was titled, “Should we make it a crime to teach a terrorist not to be a terrorist?” He used two Supreme Court cases to show how questions are not always as easy as they first seem. He brought it home by noting how close-minded some people can be when it comes to watching today’s news and politics. Each time the collection of Wabash students, faculty, and staff responded with a smattering of applause. “We have too many people who only want to listen to people with whom they already agree,” Himsel said. He then urged Wabash men to approach controversy, tough questions, and problems differently by listening to the other side. Himsel challenged the students by walking through a recent Supreme Court ruling regarding U.S. charitable efforts potentially affecting two alleged terrorist groups in Turkey and Sri Lanka. He cited the Supreme Court ruling, which he didn’t initially understand, until he read the entire legal opinion. He compared the recent ruling to a somewhat similar ruling in 1919 in the case of a woman supporting the California Communist Party’s charitable efforts. The point both times was reading the entire case, the varying Justice’s opinions, and then trying to decide what was right and what might be wrong.